Made fresh from 100% liver-approved ingredients, these mahi mahi fish tacos with chipotle-lime sauce will have you redefining the spice of life! For Tortillas: Preheat the over to 350 degrees F. Wrap packets of 4 tortillas in tin foil. Set aside. For Fish: Preheat the grill to a medium to high heat. Combine paprika, cayenne pepper, black pepper, and lime juice in a medium sized bowl. Add the fish filet(s). Allow to marinate for 10-15 minutes. For Sauce: Combine yogurt, lime juice, chipotle peppers, cilantro and water in a medium bowl, stir until creamy. Place the wrapped tortillas in the oven, allowing them to heat for about 15 minutes. Grill the fish until both sides are browned and it is cooked completely. Once fish is finished, slice the filet into small pieces or shred. 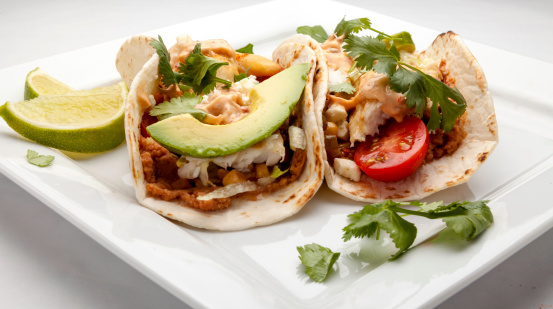 Fill warmed and softened tortillas with a layer of fish, add a layer of the sauce on top of the fish. Add a spoonful of corn, diced tomato and diced onion, and an avocado slice if desired. Serve immediately with a wedge of fresh lime for squeezing.